I am privileged to be part of Jo Ann Fore’s launch team for her soon-to-be-released book entitled: “When A Woman Finds Her Voice”. In addition, I also have the privilege of being part of Mary DeMuth’s launch team for her upcoming book, “The Wall Around Your Heart: How Jesus Heals You When Others Hurt You”. Both of these books, excellent reads, seem to go hand-in-hand. They compliment each other beautifully. Community can be a tricky thing – at times, it can be what hurts you, other times it is what helps you. Something that I read in Everything by Mary DeMuth, is that at times, God asks we heal by walking into the very thing that wounded us. When we hurt, naturally we want to shrink back, nurse our wounds and keep to ourselves. This is exactly what the enemy wants is to keep us isolated. Community is so important! You might be thinking that I’m crazy, (and maybe that we’re all crazy) with the thought that, “so you want me to walk right back into what hurt me? !” Yes and No. As Mary says in “The Wall Around Your Heart”: “Community does not always represent heartache. God uses people to heal us, to be agents of reconciliation. Finding true community can be amazing.” Years ago I was hurt by a group of people I saw as my friends. We shared many ups and downs and dreams. But eventually I was left in the dust. Then a few years ago when I went to school, I found a group of people that helped me to see that there is such a thing as true community. It was there that I found healing for what I thought was lost years prior. And even after leaving school and all of us going our separate ways, there is still a love that we found for each other. Many of us keep in touch, and although not all of us do, we still couldn’t have done without each other for those years. When you’re hurt by people, trust doesn’t come easy. But it is true. Eventually, someone will find you. Opening up in true community brings healing. Last night as I was going to bed my thoughts and prayers went up for the girls and the women who are trafficking victims and prostitutes. My thoughts were haunted by the blank depths that were found in the eyes of those I have crossed paths with. Their eyes are a black hole – as if no life is behind them. The longer they live the life (if you can call it that) they do, they withdraw everything of who they are within, becoming more and more distant. Survival is the goal, but even then there are so many days death seems better. And these are somebody’s daughters! Perhaps they once knew a loving family and had friends or a pet? Maybe they had a job or went to school? Maybe they had a hard life and then it hit even harder. Promises broken. Dreams shattered. Life as they knew it – Gone. Branded. Sold. A strangers pleasure. Be a voice. Educate yourself. Rescue these girls. 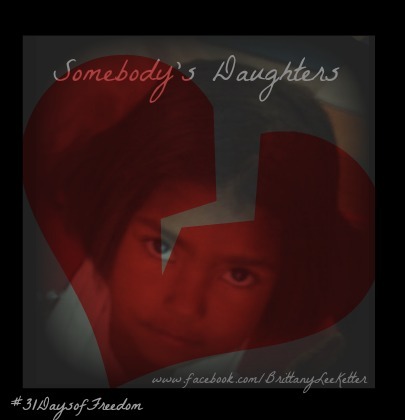 What if this were your daughter? 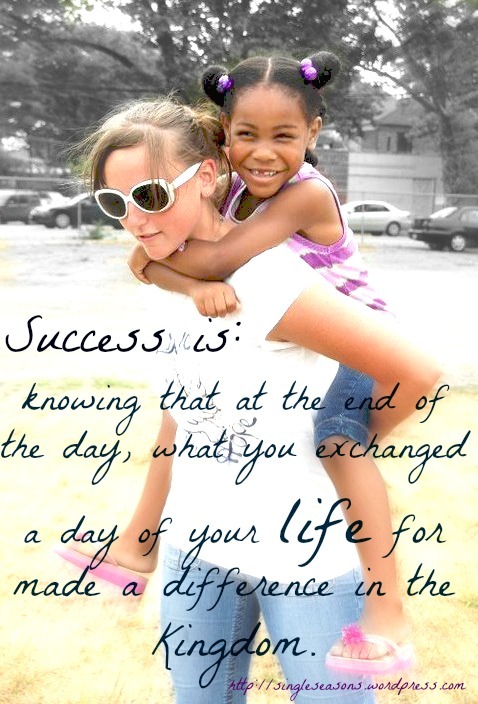 Success is: knowing that at the end of the day, what you exchanged a day of your life for made a difference in the Kingdom. That picture is from my first missions trip a few years back to New York City. I went expecting to change and to bless lives; I came back changed and blessed. Something that really hit me while in New York was the stark contrast between the rich city life and just a few blocks away the poor neighborhoods. There is basically no middle class. You either have or you don’t. The girl in the picture touched my heart in such a way I can’t express. Our first day on the streets we got to spend with a group of kids in an extremely run-down neighborhood. The kids were so excited when our group came. We spent the whole day with them. I wish it could have been the whole week. It took just moments to fall in love with these kids! Many of them cried when we had to leave. This is where I learned just how love makes all the difference in the world. This girl, Breanna, she touched my heart – even now, I still pray for her. I know that my day with her made a difference in her life – it made a difference in the Kingdom. How do you define success? Can you tell of a time when you have you been successful?